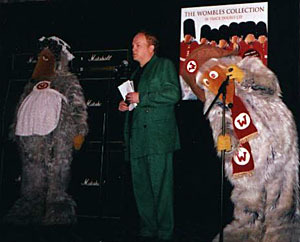 In November 2000, I was lucky enough to attend the press launch of The Wombles Collection, at the Langham Hilton hotel in London. 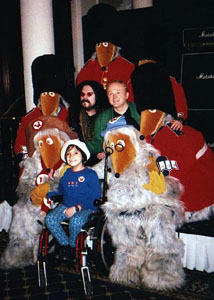 The Wombles pop group arrived in a limousine with Roy Wood and made a grand entrance, accompanied by Wombles guardsmen and even some Womble photographers. 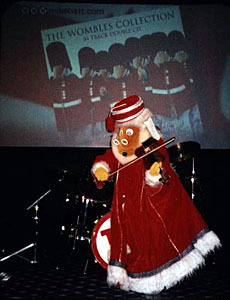 Orinoco, Wellington, Madame Cholet, Great Uncle Bulgaria and Bungo appeared live on stage for two songs, including the first ever public performance of I Wish It Could Be A Wombling Merry Christmas Every Day. 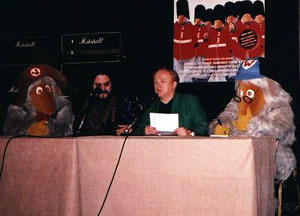 After a brief press conference, I had an individual chat with Mike Batt, The Wombles’ songwriter and producer. What age group do you think The Wombles appeal to? Obviously there are adults who used to like them; do you think they’ll appeal to kids now as well? I think there’s an audience for The Wombles at almost all levels. We thought it was going to be confined to people in their late twenties, early thirties, who remembered it from before – they were maybe 10 or 12 in the Seventies when it was happening. But we’ve found that because of the TV show, on ITV now, children are getting an awareness of them, pre-school age children. And that left a little gap in the middle, about 12 years old, but I understand from my kids that their age group are aware of The Wombles. I suppose the thing is, when you’re 12, you want to be hip and you might think that it’s not very cool. You can’t get any cooler than Luke, my boy, he’s like Cool Hand Luke and he says the guys… What they do, they appreciate the fact that the adults are into it, people like Johnny Vaughan, what I call the young adults who’ve got a hip edge, they’re obviously into it and so it rubs off, the cult side of it. I think anyone from 15 upwards remembers it, there’s some cult influence or appreciation there. When you’re 12 you’re aspirational, you want to be a 15-year-old anyway. So for some reason, there seems to be an across-the-board awareness of them. What’s your favourite Wombles song? I think my favourite is one of the more obscure ones. We had eight hits in the Seventies and the main ones are Remember You’re A Womble, The Wombling Song, Banana Rock, Wombling Merry Christmas, Minuetto Allegretto, and Wombling White Tie And Tails. 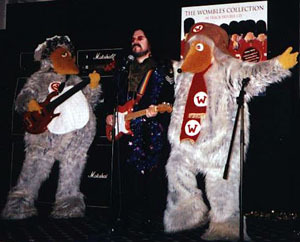 But my favourites are the more obscure ones like the Nashville Wombles, the James Bond Womble song called To Wimbledon With Love, and probably my all-time favourite is the one with the longest title ever, The Myths And Legends Of King Merton Womble And His Journey To The Centre Of The Earth. Is there any style of music that you wish you’d had the chance to do as a Wombles song? Or any style that you would never do? Let me see… there are definitely some. I would never say I wished I’d done them, because we haven’t finished yet, you know. I think if I did do another Womble album, ever (which at one time I vowed I never would), there are plenty of different styles to go for. For example, we’ve never made a rap record, which could be quite funny. I had a title, Don’t Drop The Wrapper, which I thought might be quite good for that. And then another one I’ve always fancied, you know the song from Grease, You’re The One That I Want – You’re The Womble I Want, wooh hoo hooh. That would be good. It just never ends. Also we’re thinking of doing one called Two Thousand And Womble. Really there’s no end to it, you could do all sorts of different styles. I don’t know whether there’s anything I would never do… no, I don’t think there is. I’d quite like to do a Womble boy band, as well – Westwomble. How likely do you think you are to do another album, then? Well, we’ve got the new single, of course, I Wish It Could Be A Wombling Merry Christmas Every Day, that’s sort of two tracks shuffled together. I think it’s possible that if this new single goes well, we might team up with other ‘civilians’, as we call non-Wombles, and I suppose it’s possible that we might make an album of The Wombles duetting. Who knows! Why did you use the Wombles guardsmen for the cover of The Wombles Collection, is that something that you think people will recognise after the Queen Mother’s parade? 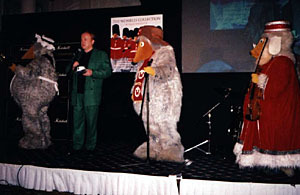 Yes, the reason we put this album out at this time – it was going to go out next year – was because it was so obvious at the Queen Mother’s 100th birthday that there was such a lot of affection for The Wombles, enough for them to be pictured on the front of The Times, and the front of The Sun. I thought, that’s a serious gesture of affection for The Wombles themselves, so why not put it out with the image of the Wombles guardsmen on the front. It makes it a bit more current. What went wrong with Sony, why did they never put out Volume Two of The Best Wombles Album So Far? To be honest with you, I just never felt Sony treated The Wombles like artists. They treated them like back catalogue. There’s nothing wrong with that, but if you’re a record company and that’s all you can afford to do, that’s it. So I said, ‘will you therefore please license it back to me, for five years exclusively worldwide, and I will get some energy behind it.’ And so I’ve done that – at some personal risk, I have to say – but on the other hand, if you believe in something, you just have to get yourself behind it. I’ve always thought that, if you really want to achieve something, you have to go for it. And that’s what we’re doing! Do you mind being known for The Wombles more than your serious work? Yes, I do actually, to be honest with you. I love working with The Wombles, I love the thrill of it, the fun of it, and just the sheer silliness of it. And yet, sometimes I think, you know, I’d rather be known as the man who wrote Bright Eyes, I’d rather be known as a singer-songwriter. I’ve written hundreds of songs that I’m happy about, and have been successful in other countries as an artist. I think to a certain extent a lot of people do know me for those things, but people do know me – in England, certainly – mostly for The Wombles. I’m not ashamed of The Wombles, I’m very happy about it. It’s nice to be known for something! A lot of people struggle all their lives and never get known for anything. So I should be grateful really. Have you thought about putting out the remaining tracks on a CD, for real collector fans who want everything on CD? The reason I didn’t put some of those early tracks on the CD – the first album of the four was called Wombling Songs, and it was made before The Wombles were famous, and they gave us a very low budget. I didn’t really feel I’d quite got into the swing of it. There are some good tracks on it, Wombling Song was on it, and one or two tracks made it to this compilation, like Madame Cholet, but there were several on it like Bungo’s Birthday, Tobermory, Wellington Womble… I’m not trashing them, it’s just because of the production, not so much the songs – because I didn’t have the budget. I felt we really got into the style on our second album, which was Remember You’re A Womble. So for this album I decided I should put the punchier titles on. I suppose one day we will do all the other ones, to complete the set. Maybe we’ll put it out next year or something. I don’t think it can ever be a big album, in terms of TV advertising and stuff like that. There aren’t enough people who want all the outtakes… Yeah, the outtakes would be fun, we’ve got some good outtakes actually. The one difference from the Reader’s Digest compilation was that you didn’t put The Wombles’ Warning on this album, why was that? That’s true – I never liked it. I mean, I liked the song, but I didn’t like the record, the production. I may re-record it or something… It’s rather an odd song. I might do a special version of it for the next outing, whenever that may be. Is there any chance of a video of all the music promos and old Top Of The Pops performances, things like that? Well, we’ve got four modern, newly shot videos, two this time around and two from 1998. I don’t know how many you need for a video, but we’re certainly collecting them and one day we will put them out, maybe next Christmas or something like that, as a DVD. It would be quite good to having the making of the video… I always carry my little DV camera around with me, so we’ve got shots of behind the scenes, cameramen and planning meetings and all sorts of things. So that might be fun. What’s going to be the B-side of the Christmas single? There are three, you have to have three formats these days. The first, main CD will be I Wish It Could Be A Wombling Merry Christmas Every Day, and then the other two tracks on it are going to be the original version of I Wish It Could Be Christmas Every Day by Roy Wood, or rather, a live version of that original song, and then also the original Wombling Merry Christmas. So there’s a set of three. Then on the second CD we’re going to have a dance version, which we’re working on at the moment, of the Christmas record. We’ve done a very dancey version, and then… I forget what the other tracks are. And the cassette… I can’t remember, to be honest. But I’ve got it all written down! Talking of dance stuff – did you like the dance mix of Remember You’re A Womble? Did it go down well in clubs? I doubt it! Somebody at the record company, they thought it was a good idea. And that’s what we’ve done with I Wish It Could Be Christmas Every Day. It’ll be a bit silly. Will The Wombles go on tour? Or do they get too hot…? 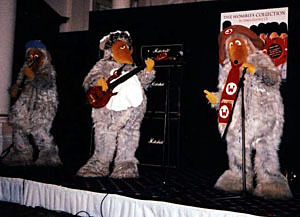 It’s almost impossible for The Wombles to do a full set, but we have worked out a way of doing it. We’ve decided that at the moment, The Wombles don’t need to go out on tour, but one day I expect there will be something. We’re thinking of an Albert Hall concert, and the way we’d do that would be a huge thing, it would be a great big production with 50 or 60 Wombles in it, riding horses and motorbikes and everything. If we do that, it’ll probably be the Christmas of 2001. I think if this album’s successful, it’ll set it up nicely for the following year. I didn’t want to do it this year because quite honestly, it would take my eye off the ball too much from this album. I want to make sure this album’s successful, and then climb the next mountain beyond it. Why is Orinoco the frontman, when he’s so lazy? Well, the reason is because he is so lazy. Erm… Because he’s the frontman, he has to be so lazy when he’s on the common. He works so hard when he’s on stage, he has to go and have a lie down when he gets back to Wimbledon Common! Is it true that Uncle Bulgaria drowned in the floods? Well, Great Uncle Bulgaria was thought to be dead, but in fact luckily, it was only his twin brother from Australia who sadly quit the mortal coil. But the good news is that Great Uncle Bulgaria is alive and kicking. At least for the time being! Are you still using the original Seventies costumes, or are they new? Some of them are the Seventies ones, some of them have been refurbished – new feet, new ears, whatever, but some of them are the originals. Great Uncle Bulgaria’s costume is the old one, one of the Orinoco costumes is – we’ve got a couple of Orinocos. But we are constantly updating them and making them a bit nicer. Back in the Seventies, was it the real musicians in the costumes? Well, it was real musicians in the costumes, but it wasn’t always the real musicians. For example, Clem Cattini – he’s one of the greatest session drummers of all time, that’s not too much of an exaggeration, I don’t think. He was on all the records, brilliantly, but in those days he was so busy as a session man and we couldn’t afford him to be on Top Of The Pops and everything. But now, as he’s a little bit older, and he doesn’t do so many sessions, he comes and is Bungo all the time. He was Bungo today, and he loves it. And his grandchildren like it! And also, we have Chris Spedding, a legendary guitar player, who often played Wellington in the past but again, he was a very busy session man at the time, so he didn’t always do it. But he’s been in the suit, not that recently, but a couple of years ago. We occasionally get some of the people that played on the records, but to be honest with you, usually these days it’s different musicians. You have to have musicians, because when Madame Cholet’s playing that bass, she really has to look like she can play the bass. Are you in touch with Elisabeth Beresford? Yes, I spoke to her only yesterday, and asked her if she’d like me to fly her across from Alderney, where she lives, to be here for the press conference. And she said – she calls me ‘dear heart’ all the time – she said, ‘Oh no, dear heart, I’m busy on something else, but thank you so much for asking.’ She’s lovely. How do you think the new Wombles TV shows compare to the old, original ones? I’ve got to tell you, I much prefer the originals. I think the Canadian voice-overs aren’t so good; I thought Bernard Cribbins’ voice was great on the originals. I cringed when I heard the new voices. I don’t think the stories are quite so good, they’ve tried to modernise them. I don’t mind Alderney as a character, I don’t mind Stepney as a character… But I think there are too many characters. There were seven initially, and that’s quite enough for a pre-school child to get around. But now there’s about twelve, with an accent on the younger ones. And that means that characters like Tobermory, a lot of the characters, just haven’t got enough screen space for a small child to get to know them well enough. There’s also this manic obsession with getting them on to weird machines like the Womcopter. I like the Womcopter, there’s nothing wrong with it, but sometimes it’s like, what else can we get them on to, you know. It’s fine… The question was, do I like them as much, and the answer’s no, but I still like them. I think they do a great job actually, the people that make this series, I just don’t think it’s as good as it was in the old days.